Today's post is Day 7 of the "How to Become a Better Dad" iDisciple Growth Trax. What’s the difference between praise and encouragement, and why are both necessary for raising confident kids? 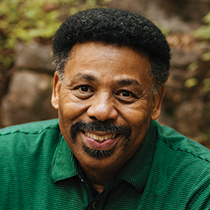 In today’s message, Tony Evans explains why our kids need encouragement the same way a plant needs water. Father, thank you for my children. Help me to acknowledge them when they’re up and affirm them when they’re down. Help me to embrace them just because they’re my kids ... but especially because they’re yours. In Jesus’ name, amen. Do I spend as much time encouraging my kids as I do praising them? Do my words and actions show that I love them for who they are and not for what they do? Embrace your kids today ... just because. Praising our kids is important, but encouraging them affirms their identity and demonstrates our unwavering love. Praise and encouragement build confidence and character—whether they’re making the team or sitting on the bench. Tomorrow we’ll see how building a family “brand” strengthens the family unit and teaches our kids diligence and dependability regardless of their circumstances.